Have I really been to three DC Pen Shows now?! I can still remember the overwhelming feeling of walking it to the old hotel and seeing rows and rows of pen vendors in 2016. Wandering though, bewildered, geeking out over some of the pen community “celebrities”, unsure of what I should buy, or what I was even doing there. At one point, I walked out into the lobby and had to just sit and close my eyes from the sheer overload of it all. Contrast that with this year, where I spent most of my time bouncing around helping friends old and new run their vendor tables, selling notebooks and pens, and hanging out with incredible people that I only have the pleasure of seeing once a year. A pen show is still visually overwhelming, but in the best way. 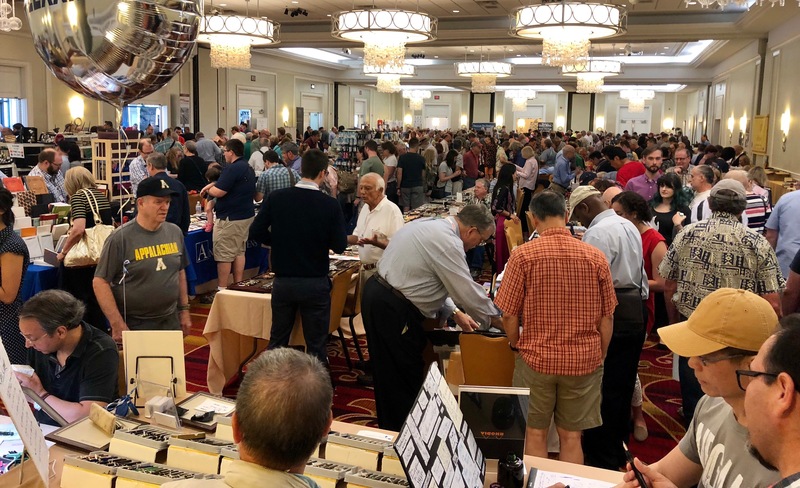 There was a lot written about the state of the DC Pen Show last year. The organizational problems affected a lot of vendors, and everyone came back with a bit of trepidation for this year. I’m quite happy to report that the problems that plagued the show in the past were nowhere to be found for me/us, which helped everyone start the weekend on a much better foot than last time around. 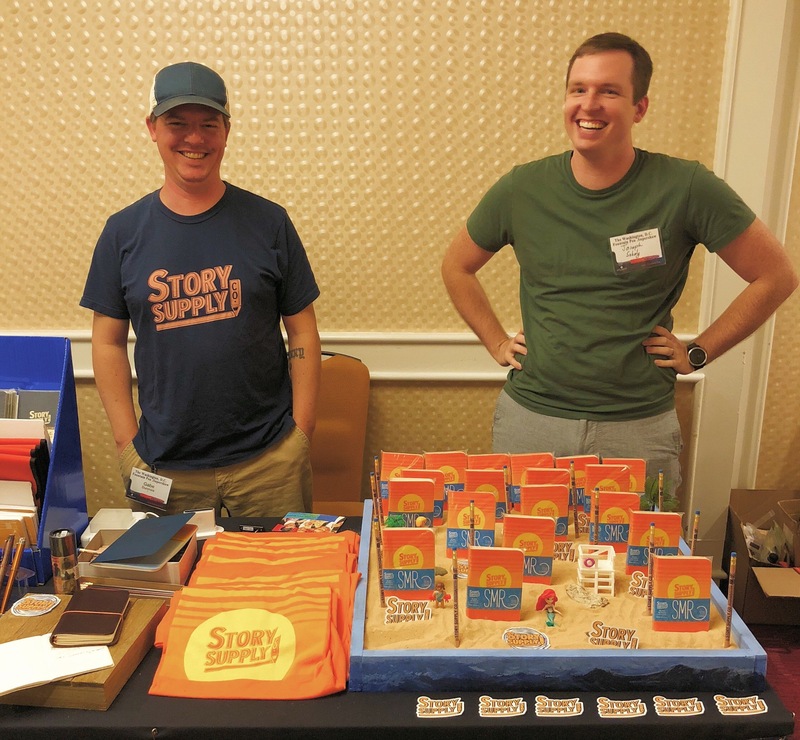 After meeting the guys from Story Supply Co at the Baltimore Pen Show in 2017, we’ve become good friends, and I’ve helped at their table at past shows. So this year, when Vito asked if I’d like to work the table in exchange for room and entry, I jumped at the chance. 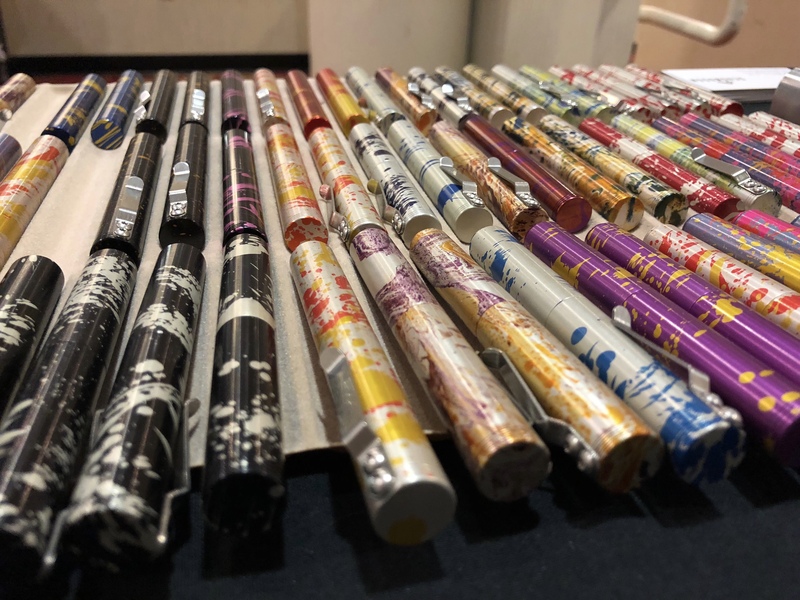 Being an attendee at a pen show is a blast, and being a vendor is just as much fun. There’s nothing quite like watching someone’s eyes light up when they find just the notebook or pen for themselves. It’s delightfully, fantastically exhausting. Our table was a popular attraction, since Gabe made a sandbox to show off the new SMR edition notebooks. I did most of my big shopping on Friday, since that tends to be a slower day from a vendor perspective, and being a vendor meant that I also had a full weekend pass, so I got some of the first dibs on the many products on display. My shopping budget keeps getting larger as I attend more and more shows, so more gorgeous work keeps coming into reach. My big purchase this year was a Ryan Krusac Legend L-15 in Cocobolo wood with a 1.1mm stub nib. Ryan’s workmanship in wood is second to none, and the level of care that he shows shines through. I like to do my ink shopping at pen shows, since you have a better opportunity to get opinions about colors and see swatches in person, so I picked up quite a few ink bottles as well. I also got to hang out with Ian Schon of Schon Designs, who has such an incredible, infectious excitement for his products. The pens that he machines are basically bomb-proof, and he brings crazy color prototypes to the shows. This year, he had a mix and match tray of pens and caps, so I picked up a crazy, mismatched splatter design. I also ended up watching Ian’s table a bit for him, since he was solo all weekend. But, as always, the real joy of pen shows comes from hanging out with people after hours. 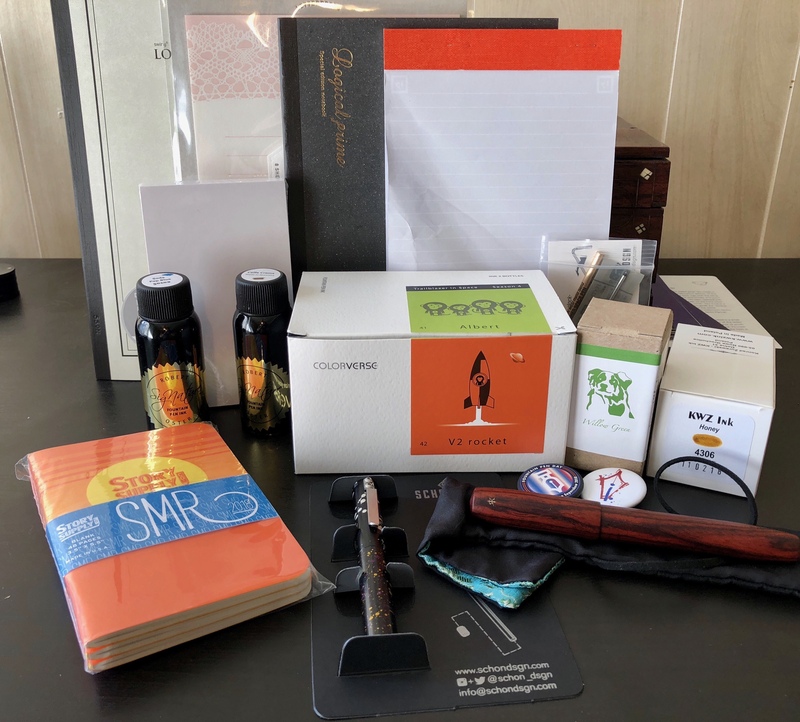 The DC fountain pen community has been growing in leaps and bounds lately, so this show was an opportunity to hang out with people I see often, and people from out of town. The Friday night bar scene was more crowded than I had ever seen it, and it was awesome. Since I have so much paper hiding in my desk, I filled my bag and laid out a bit of a “paper tasting” on Friday night, which was fun. I had planned to do it both nights, but I was so wiped on Saturday night that even the thought of hauling all that paper down from the room again made my shoulders hurt. Instead, I went out to dinner with a big group of friends, then focused on just playing with pens when we got back to the hotel. Every single show, I’m awestruck at the generosity and friendliness of people during “pen shows after dark.” Want to look at that Nakaya? Go for it, and make sure you pull out a flashlight and check out the details in the urushi work. "Did you see Dave’s LB5?" “Oh no, may I?” “Of course! What did you pick up this weekend?” There’s nothing else like those moments. And that’s my real takeaway from this weekend. I love the pens and inks and paper and things that you can see and buy, but the pen community is so uplifting and friendly that you can’t escape the excitement yourself. Two years ago, I felt like an outsider, trying to figure it out. This time, I really felt like part of the community, and all I want to do is bring more people to the show so that they can feel that same inclusion. I can’t wait for next year.